In December of 2016, the Board of Directors of the Bethlehem University Foundation created the Patrons of the Bethlehem University Foundation. The Patrons are individuals or couples who make a qualifying gift to the Patrons Endowment. By their generosity, the members of this giving society invest themselves into the work of the Foundation in its sole mission of supporting and promoting Bethlehem University. The Patrons Endowment, a board-restricted fund, ensures a sustainable future for Bethlehem University and the Bethlehem University Foundation. A gift to the Patrons Endowment is a “forever gift" that allows the Foundation to grow the endowment to better fulfill its mission of supporting Bethlehem University. This endowment is managed by the Board of Directors of the Bethlehem University Foundation and is invested in the United States with T. Rowe Price. The Patrons serve in an advisory capacity to the Executive Director of the Bethlehem University Foundation. For this purpose, Patrons hold an annual pilgrimage/meeting in Rome, Bethlehem, or another city as deemed appropriate by the membership. The Patrons are recognized at all Foundation events. The title Legacy Patron is bestowed on individuals or couples who have generously supported the work of the Bethlehem University Foundation by creating an enduring legacy through scholarships, endowments, building projects, or other means of support. 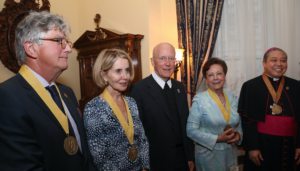 The inaugural class of Patrons was invested at a reception in New York at the home of the Apostolic Nuncio, Permanent Observer to the United Nations, The Most Reverend Bernardito Auza. Click here to view photos of the Patrons Reception hosted by Archbishop Bernardito Auza, Permanent Observer of the Holy See to the United Nations, at the Residence of the Holy See in New York City on April 5th, 2018. To further inquire about joining the Patrons, please contact the Bethlehem University Foundation at 240-241-4381. Or click here to download a pledge form to become a Patron. *The Patrons have been underwritten by the generosity of Dr. Samir and Mrs. Mary Abu-Ghazaleh.